The integration of processes shown in the Venn diagram below is critical for an individual to be a proficient learner. The acquisition of knowledge, upon which educational standards are determined, is predicated on the underlying processes of human learning. The ability to process language is a prerequisite to learning content. Specifically the ability to decode, the ability to retain sight words, the ability to spell, the ability to comprehend written and oral language, and the ability to think critically are all necessary for success in content areas. It is the goal of the Lindamood-Bell program to develop these abilities to a point that our students become independent and self-correcting. 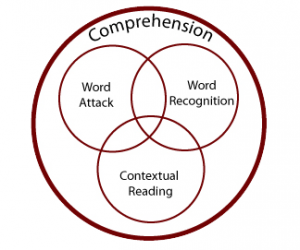 Students can successfully learn content when they can read and comprehend efficiently. Simply put, the goal of learning to read is to get meaning. Underlying these steps are the sensory-cognitive factors and their component parts.